Blogging has nowadays became very popular that everyone has started blogging, but blogging has become so common that people do not even read all your post. There are many people who just only read your post headlines, but only few will click and read your article or your blog post. 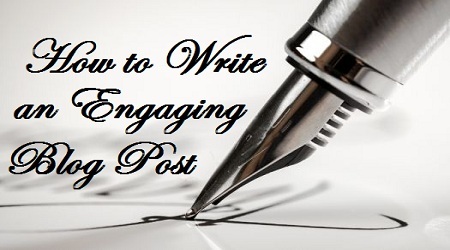 So here are some tips on how to write an engaging blog post, so that people will not only click your headlines but will also read till the end. Always use subheading in your blog post as it breaks down the sections in your post. What happens when you do not use subheading, readers will not get the idea of your content, and you will get less readers. Through subheading readers can go down to the section of the post they want to read. Always make your content conversational so that people get engaged in your blog post and does not fell as if they are listening to a lecture. Use the words like ‘you’, ‘we’ and this types words will keep your readers engaged and they will feel as if they you are talking to your reader. When you are more conversational, readers are more likely to get engage, read and respond to your post. Always try to keep your paragraphs lines as short as possible like between 5 or 6 lines. The moment you cross the limit of the lines readers gets overwhelmed and will just push the back button. If you look at my this article which you are reading right now, you will noticed that I have only used 3 to 4 lines. Always make sure you give your information on your blog post before heading to the main content or topic. Do not just come up with the facts and data without citing about the topic in the first paragraph like number one and start writing. Always try to use related and relevant photos and graphics to your post. If you do that you are trying to convey your readers and they are likely to read and stick to your content. Make sure your article is really thorough and actionable. If someone reads your article and they should get involved into your content and think I should do something after reading this or keep them engaged in such a way that they should think to read till the end.